Searching for kitchen tiles, there are several factors to consider as a client wishing to receive the world’s most beautiful kitchen tiles. When you have guests over to your home, perhaps for a dinner party, you should think about the kind of impression that you want them to come away with when they see your kitchen. Is one of understated sophistication? Perhaps you are trying to achieve a sense of carefree whimsy instead. Whatever the overall ambience that you are trying to achieve, custom kitchen tiles can help you to get there quite effectively. When creating the design plan for your kitchen, something you should always do is come up with a list of kitchen tiles ideas that would fit in with the theme that you are basing your design plan on. For instance, if your overall design scheme is the Tuscan Countryside, then possibly some custom tiles that mimic an Italian fresco would be appropriate. On the other hand, if your kitchen design in the Mediterranean, then custom tiles that depict the stunning blue Greek sea would be more in keeping. Whatever your design theme, the main point is that there are any number of creative and beautiful kitchen tiles ideas that would enhance it, adding the final and best element to the design – the one that makes it pop. One problem that many people encounter, however, is that they get stuck in the initial stages of design planning. It is difficult to think of a design scheme that the entire family agrees on in the first place, let alone agree on the custom kitchen tiles ideas that will tie the whole thing together! If that is the situation that you find yourself in, take a look at some of these example themes, patterns and custom tiles ideas. Possibly one of them could be exactly the thing that you are looking for. If not, maybe one of them will spark that perfect idea in your mind! Looking for specific ideas to get the job done properly? There are several designs that one can use in order to get the right appeal. Each kitchen has its own appeal, and this has to be taken into account. Does one want to go with a more elegant, solid coloured approach instead? These are all factors that have to be taken into account beforehand. There is a boatload of designs to choose from, and the team can assist clients in making the right choice. When your design scheme is French country style, you can add a bit of flair by having a custom tile Art created that depicts a country cottage, or other elements that define the style, such as a vintage blue watering can or the lovely and ubiquitous wildflowers that generally accompany this type of design. 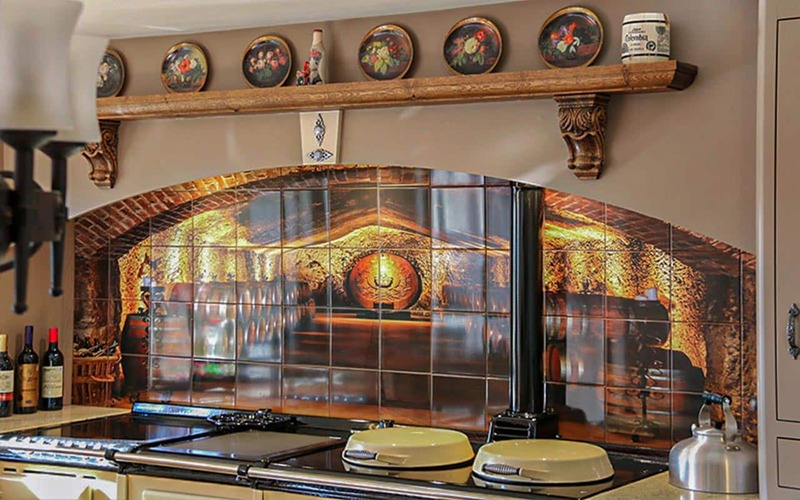 When creating a shabby chic kitchen, the picture tiles you install should depict some of the most important and iconic elements from the Shabby chic school of design. For instance, they can show a scene of a cozy, overstuffed armchair surrounded by an aged and distressed bookcase – filled to overflowing, of course, with well-loved and well-used volumes to add that sense of pleasant clutter that is the epitome of the style! There are few things that people look forward to in the morning the way that they do their morning coffee. In fact, when many walks (or stumble, as the case may be!) into their kitchen each day, it is the first and foremost thing on their mind. If coffee is the theme that you have chosen to centre your decorating on, there are many choices for a custom tile murals. You could commission a mural that depicts coffee cups surrounding a carafe of coffee, just waiting to be poured. Alternatively, you could base your theme on a scene further back in the coffee supply chain and have a mural created that depicts coffee farmers hard at work, or burlap bags were overflowing with fragrant and gorgeous deep brown coffee beans. The possibilities are endless when creating a visual for a theme as diverse as coffee. There are many visually iconic elements that a custom tile mural can portray when the theme of your kitchen is that of a ’50s diner. For instance, the tile can portray a waitress on roller skates, a bright red vinyl booth, a burger and milkshake, or – perhaps the single most iconic image having to do with this style – a colourful and cheerful jukebox. Whether you are decorating your kitchen primarily for your enjoyment or whether you are attempting to create an impressive design that will wow guests and visitors, bespoke tiles are the key to creating or completing a stunning theme! Ever seen a custom kitchen makeover that has been done poorly? Often, the reason for this is because the service was unable to provide the finish that was required to make the kitchen aesthetically appealing. Custom kitchen tiles can only make a kitchen look beautiful if it is done with a creative eye. 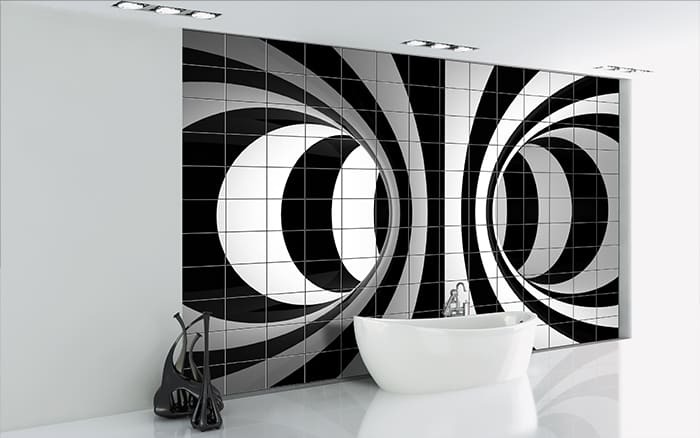 UniqueTiles can guarantee aesthetic results because a team of creative artists can work alongside to help the process. These are individuals who understand what it takes to make the kitchen splashback and look elegant to the eye. The overall finish of the kitchen has to be in sync with the client’s requirements. If they are not, the kitchen will look mediocre, and this is not what clients want to see. Quality is about making sure the results are not only aesthetically appealing but are durable at the same time. If the kitchen tiles do not last, the chances of the client being happy are slim to none. This is why UniqueTiles uses the finest materials in the world to get the job done properly. Clients deserve the best, and this company aims to provide this quality. The ability to do this comes from the company’s years of experience in the field. Clients will be getting a proven team of professionals each step of the way from the assessment to the finishing touch. Whatever the assignment may be, UniqueTiles gets the job done and then some. This is one of the best teams in the industry, and they have proven results to back up their promises. A service based on providing custom kitchen tiles has to not only be relentlessly precise but professional too. The client’s satisfaction can only be maintained when the final appearance is as they had imagined. UniqueTiles can provide a professional experience because of the rigorous training all employees are placed through. This ensures all completed jobs are done as required or better. 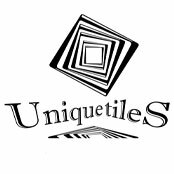 By being professional, UniqueTiles can guarantee a high-quality result every time for its clients. The team is always willing to accommodate the client to ensure the results are as desired.